Before there was Yalla Y'all, there was a Yahoo! group called Raqs Atlanta. Run by Andye-Andinha Niakan with the help of some friends, Raqs Atlanta is the original source for news and educated opinion about not just belly dance (or whatever you choose to call it), but the metro Atlanta international community as a whole. Whether it's an annual Persian festival, a South Asian wedding expo and fashion show, a workshop with a world-renowned dance instructor, or a local student showcase, you can often find out about it beforehand at Raqs Atlanta and sometimes even read Andye's informed review of the event after the fact. This coming Thursday, June 28, metro Atlanta's belly dance community will celebrate the 14th anniversary of Raqs Atlanta and pay tribute to Andye's years of dedication at the Raqs Atlanta Anniversary Party. The party will be at Tongue & Groove (click for location info) and is schedule to start at 9:00. Featuring performances by some of the top local talent, this will be an event to remember! I will have the honor of introducing three of the performers and sharing some of Andye's most memorable experiences from the past 14 years. Visit the Facebook event or event web site for more information and to request your invitation. It's free if you're on the guest list. I hope to see you there! This event comes at an interesting time for Yalla Y'all. There's been some vigorous online dialogue this week about best practices for event scheduling, and in particular the best sources of information on upcoming shows and workshops. I'm honored that this site is now widely considered a compliment to Raqs Atlanta and a leading source of information for the community -- that was my goal, and I believe I've achieved it! I feel that the conversation that's going on right now will help bring the community together and result in more success for anyone planning an event. So if you're new to Yalla Y'all, welcome -- and please come back often for a complete calendar of upcoming workshops and shows in metro Atlanta and north Georgia! Tribal Dance & Drum Jam This Thursday! Can you tell I love ATS?!? certification workshops with Megha Gavin and Carolena Nericcio. Lacy says, "You don't have to know ATS to enjoy watching its magic unfold or dance to the beat of the drums in whatever style moves you. Just come enjoy the vibe! No performances, just a good old-fashioned drum circle & dancing." The drum circle will be led by master percussionist Danny Stern, and if you haven't seen and heard Danny perform you're in for a treat. Bring your drum, your finger cymbals, and your fluffy skirts and get ready for an epic ATS throwdown! Just $5 at the door. Bottled water and snacks will be available for purchase. 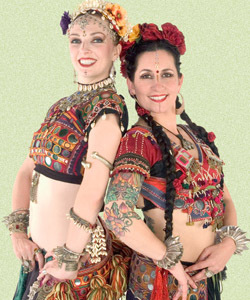 Located at Atlanta Fusion Belly Dance, near Ikea & Atlantic Station. RSVP to the Facebook event for more info! The next few weeks will be pretty quiet in the metro Atlanta belly dance world... but there are a few workshops with very prominent dancers coming up this summer! This is it! ATS® General Skills Certification & Teacher Training with Carolena Nericcio and Megha Gavin, right here in Atlanta! And if you aren't already registered for the workshops, you'll just have to bask in the knowledge that these ladies are actually within driving distance of wherever you are. However, mere mortals are invited to a Tribal Dance & Drum Jam Thursday night at Atlanta Fusion Belly Dance. A drum circle led by the uber-talented Danny Stern will provide the backdrop for whatever kind of dancing you want to do (and you know there will be some ATS throwdowns)! Admission is just $5. Personally, I can't wait to put on my dancing shoes for this one! The workshops will take place at Atlanta Fusion Belly Dance, and the whole thing is presented by Lacy Perry and Beledi Boutique. General Skills is sold out, but passes are still available for Teacher Training. I heard today that there are only eight spots left for Crossroads & Origins, featuring Donna Mejia, Rina Orellana Rall, and Lee Ali and brought to us by Ziah and the Awalim Dance Company. Only 35 people will be attending this intensive session with three master fusion artists at Academy Theater in Avondale Estates. There will also be a show on Saturday night that is sure to be amazing, featuring Donna's uniquely powerful style (which often includes hip-hop influences, as well as elements of West African dance); classic Flamenco from Rina, who is a founding member of FatChance Belly Dance; and a taste of Lee Ali's signature North African or trance styles, of which she is an acknowledged master. Lee has been performing since she was in her teens, and has done a wonderful job of encouraging dialogue throughout the community. This event will be focused on belly dance fusion -- not Tribal Fusion, but dance forms that any belly dancer can use. The instructors are all dancers who fully pursue both belly dance and other dance forms, not just belly dance fusion artists who add accents into their dance. All three artists will be conducting discussions along with movement classes. Visit the event web site or the Facebook event to learn more!